Sri Lanka’s government has transferred police inspector Nishantha Silva, who was investigating several major investigations into attacks on journalists during former president Mahinda Rajapaksha’s tenure out of the Criminal Investigation Department with immediate effect raising concerns about the future of his investigations. 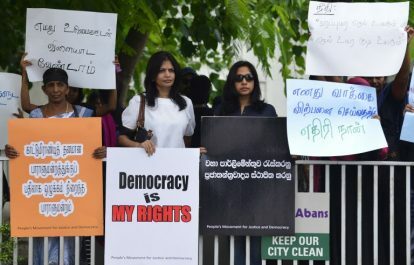 The International Federation of Journalists (IFJ) joins its affiliate Sri Lanka Working Journalists Association (SLWJA) in expressing serious concerns over the events that threaten press freedom, justice and labor rights movement amid the political crisis after the appointment of Rajapaksha as prime minister. Silva was the chief investigator on several major investigations into attacks on journalists including the abduction and assault of Rivira’s former editor Upali Tennekoon, Nation deputy editor Keith Noyahr, senior journalist Namal Perera as well as the assassination of Sunday Leader editor Lasantha Wickrematunge, and others. Silva was reportedly transferred on the order of the Minister of Law and Order on the direction of President Maithripala Sirisena. Meanwhile, the SLWJA leadership have been threatened for speaking out against issues facing the media, particularly threats to journalists in the state media organizations. Since the beginning of the political crisis in late October, SLWJA leaders including president Sampath, immediate past president Lasantha Ruhunage, vice-presidents Kanchana Marasinghe and Shantha Priyadarshana, general secretary Frank De Zoysa, national organizer Nimal Abeysinghe, treasurer T Nadarasa, and other committee members have faced threats and harassment for the works of SLWJA is advocating for journalists rights, and opposing attacks against journalists and media. A video of Ruhunage, also the deputy editor of the Anidda that protested the appointment of Rajapaksha, and members K. Sanjeewa and Tharindu Uduwaragedara informally chatting to organizers of a press conference called by Sri Lanka Lawyer’s Association was broadcast on television channels and circulated on social media labeling them as traitors.